"For your gift, I'm going to clean your bathroom." I would do... sit and hold my babies. It is not an exaggeration to say it was pretty terrible. My kids were six, two, and newborn, and I had a cat whose litter box did not get changed nearly as often as it needed to be. Oh, and half the bathroom was carpeted... not pretty. But my friend, Sandra, did it anyway. And she did it without judgement. During that pregnancy (with my now 15-year-old, Ella) I had become a single mom. While I'd remained optimistic for those last few months, once I brought her home, reality set in and brought depression along with it. Keeping up with cleaning was the last thing on my mind. Sandra's gift gave me the ability to breathe again... figuratively and literally! To this day I remember it as the best baby gift I've ever received. remember days as a new mom with my first two children, when I was not single. 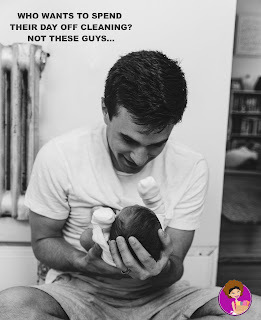 Having someone clean for us, or take care of laundry, or even make a trip to the store for us, without judgement or guilt, would have been amazing then as well. That's why I've decided to create a Hire A Housewife Baby Registry! Not only will the parent(s)-to-be get an amazing gift they can use when it is most needed, but all of their friends can easily pitch in for a bigger gift that they know will get used. In addition to that, we will add one free hour of cleaning to the account for each six hours purchased. That comes to an overall discount of almost 15%!!! Watch for an email containing downloadable images for the shower's Facebook event, a Facebook post, invitation inserts, and/or stickers. The email will also include the basic information that we send to all new customers so you can have an idea of what our services are. We should have it to you within 24 hours of registering! Your friend/family member buys a gift through our site. They mention it is for your registry in the notes. Your friend/family member prints out a message that they contributed to your registry account. While we have this info, we will not share it with anyone except you. On the baby's DUE DATE or BIRTH DATE (whichever is sooner) we'll send you an email letting you know how many hours you have in your account! The hours will be available to use starting on that date. 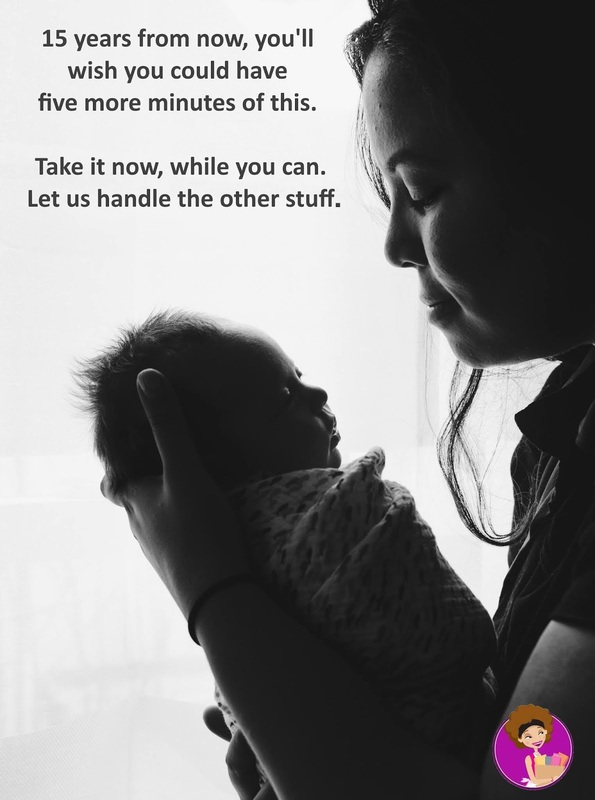 The free hours stop accruing six months postpartum. We also have a referral reward available! Registered moms who use their accounts and put your name as their referral could add up to free hours of housekeeping or free meals from Prep Freeze Cook! One reward per registration, but multiple referrals are allowed!